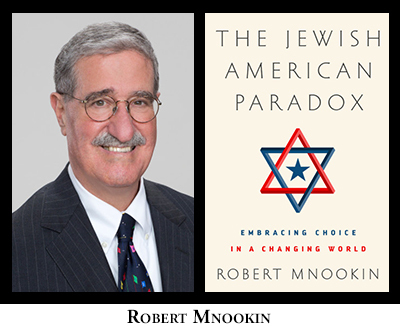 Please join us at Roosevelt House as we welcome Robert H. Mnookin, the Samuel Williston Professor of Law at Harvard Law School, who will discuss his acclaimed new book The Jewish American Paradox: Embracing Choice in a Changing World. Mnookin will address the questions at the heart of his book: Who should count as Jewish in America? What should be the relationship of American Jews to Israel? Can the American Jewish community collectively sustain and pass on to the next generation a sufficient sense of Jewish identity? In Mnookin's view, the situation of American Jews today is deeply paradoxical. Jews have achieved unprecedented integration, influence, and esteem in virtually every facet of American life. But this extraordinarily diverse community now also faces critical and often divisive challenges, including intermarriage and deeply conflicting views about Israel. Mnookin, the Chair of the Program on Negotiation at Harvard Law School, and the Director of the Harvard Negotiation Research Project, argues that the answers of the past no longer serve American Jews today. In his talk he will outline his vision of a radically inclusive American-Jewish community that embraces diversity and debate -- one where being Jewish can depend on personal choice and public self-identification, not simply birth or formal religious conversion.